Words and pictures by Phil Mitchell. Taking the junction of Thepprasit road and Sukhumvit road as a starting point. 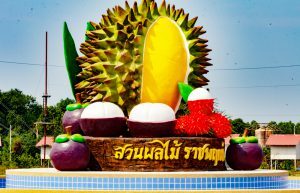 Drive south from Pattaya for 8 miles and turn left at the Buddha road traffic lights. After you cross the railway lines you will be travelling along the newly surfaced and smooth Buddha Mountain road. Drive a further 2.8 miles, and take another left. After a short drive of 0.3 miles, you will come across the Tarzan Extreme Park. It has taken the owners, I. Park and Min Gyu I, together with a group of specialized builders and a team of dedicated helpers 2 years of hard work to transform this 55 rai of fertile land into an adventure park. Soon to be available in the park will be a vast number of fruits planted, with the Orange, Lime, Coconut, Banana, Cherry, Santol, Dragon fruit, Mangosteen, Jack fruit, Pomelo, Wollongong fruit and many other fruits that now live side by side or rather below the 8 to 15-meter high zip lines, also there will be the fruit and drinks from the ever-growing field of Pineapples. On your arrival, you will be met by the charming Miss Kim or the equally charming Supansa, and after a quick stop for coffee in the air-conditioned Tarzan coffee shop, it’s off to one of the 30 stages of breathtaking zip lines. 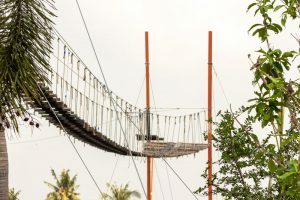 From here you have to manoeuvre your way across the many wooden slatted jungle style rope bridges. -Let’s hope your balancing skills are up to par. There is also going to be pistol shooting range at 350 baht for 8 x 45mm rounds and shotgun shooting with 5 x 12 bore rounds for 450 baht. Let’s hope they have some heavy-duty ear defenders.If that’s not enough for you, there are also 10 elephants. The youngest is only 4 years old and the oldest is a young 20-year-old in constant search of bananas from passing visitors. 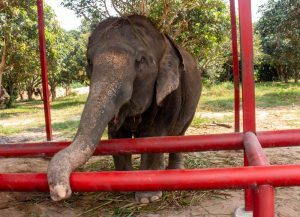 A 15-minute elephant ride will cost 300 baht.